Youngstown - The Youngstown State women's tennis team improved to 2-0 on the season with a solid 7-0 win over Niagara on Friday night at the Boardman Tennis Center. The Penguins won all three doubles matches then cruised to straight set wins in all six singles contests. At No. 1 doubles YSU won 6-0, 6-3 at No. 2 and 6-0 at No. 3. At No. 1, Dominika Lackova picked up a 6-3, 6-4 win while at No. 2 Noelly Nsimba cruised to a straight set 6-4, 6-1 victory. At No. 3, Ana Stroe won in straight sets, 6-2, 6-2, while at No. 4 Imaan Hassim won 6-1, 6-3 and at No. 6 Cassandra Moraleja won 6-0, 6-0. In the final match of the night, Monique Belovukovic picked up a straight set win taking her second set 7-6 (7-3) afrer an impressive 6-1 triumph in the first set. 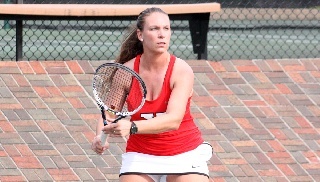 YSU plays host to Duquesne on Sunday morning at the Boardman Tennis Center. First serve is set for 8:30 a.m.